Despite being another sequel in a longtime Nintendo series, Fire Emblem Fates is... quirky. Its Japanese version sparked quite a bit of controversy among English-speaking fans when it launched last year. Nintendo is making some fairly significant changes. As I reported last week, Nintendo is removing a scene that’s been regarded as homophobic from the upcoming English version of the turn-based tactical role-playing game. It involves your male player character spiking the drink of another character named Soleil, a woman who’s physically attracted to other women, with magic powder. The result is that she comes to see men as women, ultimately falling for the (male) player character. Given the historical context of things like gay conversion therapy, it’s a plot line with serious potential to re-open some old wounds. Also, it’s convoluted as the goddamn Da Vinci Code—or the latest sequel in Dan Brown’s book series series, B.o.B’s Twitter feed. Another point of contention in the Japanese version of Fire Emblem Fates was a feature that let players use the 3DS touch screen to stroke characters, some of whom would respond with suggestive dialogue. It got excessively, um, interesting when it involved the player character’s adoptive siblings (who are apparently still romanceable). You can read a few fan translations here, if you want. While the English version of Fates still includes many relationship-building activities by way of robust castle functionality, Nintendo confirmed to me that petting is 100 percent out. It’s unfortunate, given that moments of physical intimacy are so rare in games, especially as a means of building character relationships. The rep explained, defending the original intent of the Japanese version. Kotaku: I was told that a feature in which you can use the touch screen to directly touch/”pet” your characters is also out of the localized version. Is that the case? UPDATE 2 (2/15/16): Nintendo has clarified to us that a tapping game involving waking your spouse up is in the game. I asked Nintendo for more information about specific changes—especially in regard to Soleil and other romances that take potentially localization-unfriendly turns—but Nintendo didn’t want to spoil specifics. They did, however, once again offer that making changes in the name of localization is not unusual, and that it’s happened with many of their games in the past. I got to play a bit of both the Conquest and Birthright editions of the game during a recent Nintendo event in San Francisco. 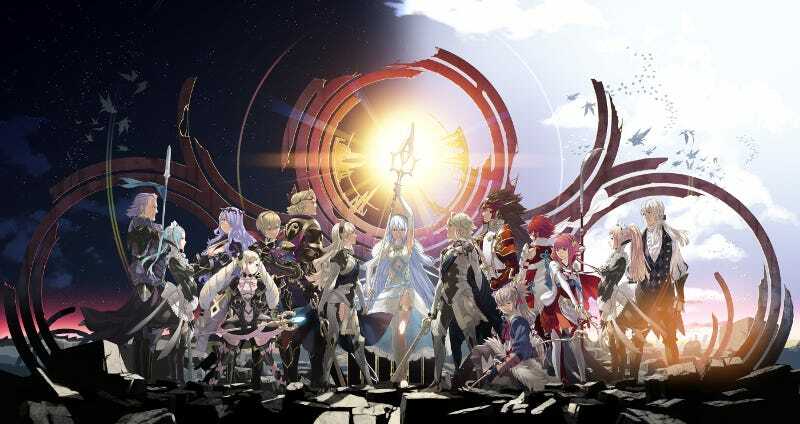 Good news: localization changes or not, Fates is pretty much More Fire Emblem (in a good way). It’s got some cool bells and whistles (I’m especially excited to really dig into the castle features and get way too attached to my band of fantastic hair styles with people attached), but battles are extremely similar to those in the series’ previous 3DS entry, Fire Emblem Awakening. While I don’t love the idea of shelling out for multiple versions of the game, I did enjoy just how different they seemed to be. They begin in roughly the same place, but after around five chapters, you reach a pivotal moment—a choice in which you can, if you so please, spend more money (ugh) and download the game’s other version on the spot. After that, the stories diverge significantly. Birthright’s a lot like Awakening. You’ve got a big army of goody two-shoes (and yes, characters have actual feet this time!) ragtag hero types, and you can move around a world map, tackling missions and assorted battles as you please. Of the two versions, most people will likely find it easier. I played a level in which I fought off an army led by the main character’s adoptive sister, Camilla. It was fun, but not particularly difficult. I wanted to reason with Camilla and get her on my side, but there was no option for it—at least, in that level. Conquest is intended to be more like an old-school Fire Emblem game: less choice, more challenge. You’re essentially rolling with the “bad” guys, and you often end up out-gunned, if not out-smarted. At the Nintendo event, only four people (of probably around 30) managed to even beat the Conquest level, which saw the main character’s army backed into a corner, forced to defend for a handful of turns. I’ve played quite a bit of Fire Emblem over the years, so I decided to try and beat the level without losing a single character. I would’ve pulled it off if I hadn’t gotten impatient (and therefore, sloppy) on turn nine. Oh well, I still won. It was challenging, but not the most brutal Fire Emblem level I’ve ever played. It was definitely a marked change from the level I played in Birthright, though. All throughout, the localization was fine. I did a few pre- and post-battle conversations between party members, and—much like in Awakening—relationships were characterized by wartime grimness juxtaposed with ever-so-slightly zany anime tropes. In one vignette, my character offered to essentially stalk another character and constantly sing his praises to boost his confidence. The other character was understandably weirded out. In another conversation, a character tried to bribe his romantic interest into being less icy and closed off from everybody else with her favorite candy—while mixing in some stuff about her weight. Casanova he was not. If what I played is any indication, Fire Emblem Fates is Fire Emblem Awakening after a morning pot of coffee and a nice, wholesome breakfast of steroids. I’m intrigued, albeit not completely sold, because who knows? Maybe most of the levels are terrible and the characters are all whiny, argumentative garbage babies. It seems pretty unlikely, but constrained preview events aren’t super great for holistic evaluations of games. Expect more in the next couple months.